So I decided to jump in on the Kickstarter for the Oculus Rift. It’s a virtual-reality headset, currently being built for game developers, with the goal of creating an affordable, high-quality consumer headset that can be used for games. I’ve been looking for something like this for a few years now: a virtual-reality display that completely wraps around your field of view to totally immerse you in a computer-generated world. The creator, Palmer Luckey, said in his initial video that he went looking for an immersive VR display that he could buy, and they didn’t exist outside of specialty helmets that cost $10,000-$100,000. I felt the same way, and thought that with the advances we’ve had in display technology, this kind of thing should be feasible. It looks like Palmer decided to make one himself, and famous game designers like John Carmack and Gabe Newell are already on board and working with the device. So I’m on board too, in my small way, and made a pledge to receive their developer kit. The reason they want to get this to developers is so that software can be written for the device, and games made available by the time the real consumer version comes out. I’m still not entirely sure how I’ll contribute, but since Unity has already committed to supporting the hardware, it would be simple for me to add support when I decide to write a 3D game. And there’s even more Kickstarting game developer news! (I should really post more often…). We also sent pledges in to the Ouya project, which is an open Android-based console that connects to standard TVs and uses a traditional-style controller. Since we already support Android in our development, it should be fairly simple to add support for the Ouya console. I’ve had some game ideas that I thought would work well if only we had controllers, and now this comes along! Updates were released on iTunes last night, so the game should have more verbose descriptions and help. Still waiting on another update for Amazon to fix a “read phone state” issue. Thanks to Becky and Gus for finding that one! It’s been difficult getting started on the next game. Seems like there are a lot of things going on right now to distract me. Trying to get more interest and coverage of V Vs. V, fix some issues and try to come up with a meaningful future update, working on the new game prototype, real life and full-time job stuff popping up as well. I’m holding together, I think. Trying to remain optimistic, when optimism is not my default mental state. We pushed out a small update on Friday for Villagers Vs. Vampire (and thursday on Google, but we had to fix that one) to make some UI tweaks, add some help and tips screens, and label all our menu buttons for easier understanding. Still only getting about a sale or 2 a day, but it’s OK. I managed to get it written in my spare time, and have had about a thousand players so far, so that’s an accomplishment at least. Going through the experience also means that the next game we write either A) may not take as long, or B) take as long, but with more content and polish. I’m hopeful of either scenario. Speaking of next, that’s what we’re doing right now! Looking at the mechanics of our next game and getting a structure started so we can prototype it to ourselves. We’re thinking it will be a puzzle game with a space mining theme, coupled with a crafting system and some economics as you fly to other planets to sell your wares. It’ll be 2D, like V Vs. V, with upgradeable this’s and that’s. We seem to have an algorithm for the mining mechanic, but we still need a prototype to see if it’s actually going to be fun or not. So, on we go! Have a good week, everybody. Coming to the end of our 5-day vacation here. I think I’ve had enough time to get my head clear and refocus on work, but one never really knows. Right now, we’re working on an update for Villagers Vs. Vampire, making some UI tweaks, and adding some help and tips screens. Not everyone follows my line of thinking, so it makes sense that we would need those. Also, it’s still surprising to me that the Amazon Android version is currently our top seller. It’s been the general consensus that sales on Apple devices are routinely 10 times that of Android versions, but that’s not what we’re finding so far. Right now, Amazon leads Apple 3 to 1. That may change if demand for our game picks up. We haven’t yet sent out for website reviews, so that may be a part of it. I’m also considering more advertising, even though we’ve already spent a good deal on it for questionable results. Other than that, our focus is turning towards our next project. I’m thinking of something sci-fi / space-ish, but still having some puzzle elements. Like an asteroid mining game, with some crafting and making trade runs with your ship. Still working out the details, and we’ll have to see if the main puzzle game will actually be fun or not! Anyway, thanks for checking in, and have a good evening! Villagers Vs. Vampire has been (mostly) released for a week now. So how are we doing? Well, good and not-so-good. Our sales and downloads have been pretty low. My best guess is that about 250 people have played our free online version here on the website. We probably have around 500 free downloads from Apple and Google, and about 80 sales between Apple and Amazon. We’ve had maybe 2 or 3 reviews total, across all platforms. The ad revenue from the free versions is pretty abysmal…if I added it all up (and we’re talking about 10 different ad networks) I might have $5. Ads only really work when you have 100,000s to 1,000,000s of players. I’m not sure that we’ll use ads again in future games, because so far the trouble and nuisance hasn’t been worth it. On the plus side, however, everyone who’s played the game and written to us has enjoyed it. They find it compelling and fun. Those who know us (and some who don’t) have been talking us up and trying to get new people to play our game. It’s very gratifying and humbling to see this kind of support. I feel like we’ve really accomplished something in getting a game completed, published, and in the hands of people who actually like it! Plus, even though smartphone games are very front loaded sales-wise, it’s only been a week. So, as I’ve said before, even if the game doesn’t sell much, it can’t be a failure in my view, because the experience I’ve gained by working on it has been immensely valuable, and each subsequent game will improve on the last. This is just the beginning of the road ahead of us. We’re already discussing and planning out our next project, which I’ll talk about in more detail when/if we actually start it. Meanwhile, we also have ideas for V Vs. V (and give us a shout if you have some of your own!) and we’ll keep it updated in the coming months as well. I’m also going to try and be open about our sales data and experiences. I’m always very interested in the data that other small indie developers publish, so mine may be helpful to someone in a similar boat. Villagers Vs. Vampire Is Released! Our game is now out on Apple, Amazon, and right here on our website. We have the exciteds! Also, play right now for free on our website, http://vvv.perceptivepumpkin.com/playonline/. It does require the Unity web player to play. This is the result of 8 months of free time, but in some ways, the work is just beginning. Now we need to let more people know about it, improve on it and also look ahead to our next project. Thanks for your support, and happy gaming! Tiff and I had some intense discussion about the Android market and Google’s support of it. We were looking over various ways to use licensing features and in-app payments for a Google Play/Android version of Villagers Vs. Vampire. Ultimately, we decided “Screw it”. We don’t need any additional DRM in our apps. More often than not, DRM hurts your customers, your REAL customers that truly support you, while hackers, who weren’t going to pay you anyway, end up with a superior experience. We want our players to have the best experience possible, even if we “lose some sales” along the way. In related news, it turns out that the Android market is actually worse than I imagined, and I was already prepared for the bevy of different devices and operating systems. I did not know that Google still won’t take responsibility for sales taxes, and leaves the collection AND DISTRIBUTION of sales taxes solely to the developer. So I would have to collect and distribute sales taxes to every locality of every user that bought the game, including overseas countries. You’ve got to be kidding. Apple and Amazon take care of this, and it provides a much more straightforward process. I thought this was a solved issue by now, but apparently not. I now understand why so many developers only put out free ad-supported versions, and why in-app payments haven’t taken off. I understand even more why the Android market is not the first place developers go to when starting new projects. I was already pessimistic going into it, but after delving further into the nuts and bolts, I’m just stunned. Google should be able to do better than this, especially in light of the 30% cut of sales they take. So here’s what we’re going to do. We’re going to follow the collective wisdom of other developers and only release the ad-supported free version to Google Play. The full versions without ads will be available on the Apple and Amazon app stores. My sincere apologies to any of our Android fans who didn’t want to deal with ads. I encourage you to download the Amazon Appstore App and get the full version from there. Once Google gets their act together over their own operating system, perhaps we can do more on the platform. Anyway, speaking of Amazon, our full version should be available there tomorrow. I wish the free version was out as well, but it’s still in review unfortunately. Both Apple versions haven’t gotten to review status yet. We should have the web version up in the next few days or so, though. So some bumps in the road, but forward progress is being made. 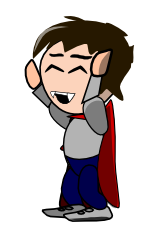 The full version of Villagers Vs. Vampire ($0.99) has been approved on Amazon, so that version should be available on Sunday, 6/24! The free version had a missing line of code (don’t you love that?) so I had to re-upload it. Don’t know if it will be available by then. Apple hasn’t started reviewing either of our versions yet, so it appears our release schedule will be a bit staggered. Oh well. We’re moving forward with our plan to release a free web version on this site, so we’ll let you know when that’s up and running. Currently doing some A/B testing of ads to see if any of them are effective. I should have a set of data to compare by the time Sunday rolls around. I’m trying my best to take all indie-related advice into consideration (especially the business side of the equation), so that we can start off on the right foot. I should have started some of the marketing earlier, but overall I think we’re doing fairly well. Other than that, some very nice comments and impressions about our game and the video, and we greatly appreciate the support! Hope to have more good news soon. V Vs. V Gameplay Video! We’ve just uploaded a short gameplay video to Youtube. <Khajit> Take a look! </Khajit> We created it using Fraps and Sony’s Vegas Movie Studio 11. I normally avoid Sony products and software like the plague, but I’ve been shocked and amazed by the quality of their video editing software. Best $45 I’ve spent in quite a while! Anyway, to the video! If you like what you see, click on the Like button to send some happies our way. We hope to have the game released soon and are awaiting approvals with crossed everythings. Thanks for the support! Click here for more info on our first game!